The highlight of my trip to Svlabard was an overnight trip from Longyearbyen to Pyramiden, a near-abandoned Russian mining settlement reached via boat. I booked with Arctic Explorer because it offered the better schedule, though other companies offer full meals onboard (such as BBQ whale) while we just had complimentary coffee + biscuits and snacks for purchase. Cost for two r/t tickets to Pyramiden was NOK 3,400 ($413) and easily reserved online. We booked only a couple hours before our trip and had no trouble calling the office after to arrange a pick-up from our Airbnb. Everyone knows everyone in Longyearbyen. A bus driver who looked like a veteran seafarer with a full white beard picked us up and brought us to the boat dock. 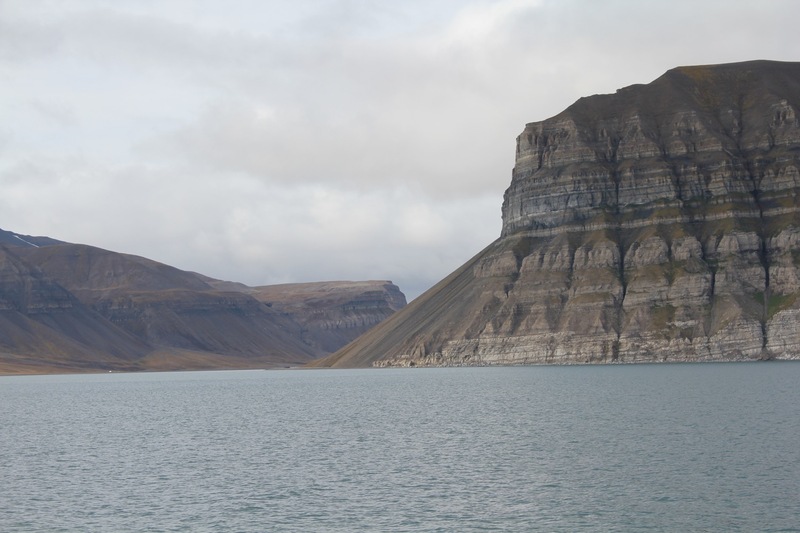 We departed midday from Longyearbyen and our departure was delayed a bit due to a late arriving vessel. The boat makes a morning trip to Barentsburg, another Russian mining village, before returning to Longyearbyen and continuing to Pyramiden. Our journey to Pyramiden took 2.5 hours on the way out because we traced our path along the coast of the Billefjorden and stopped at the beautiful Nordenskioldbreen glacier, where ran into a whale. Our guide onboard, Liga, did a wonderful job explaining the history, biology, geology, and zoology of the region. Finally we docked in Pyramiden and were ushered onto a bus for our tour. You can see the journey back the following day was much clearer and we again ran into polar bears. The direct journey back from Pyramiden only requires 90 minutes. Forget the whale – you got a picture of a polar bear! How cool is that? Did you need a Russian visa? We just returned but only got a single entry visa. Nice! Thanks for sharing this article. I found the useful information about the trip from Longyearbyen to Pyramiden. Thanks for sharing such a nice pics and informational post….